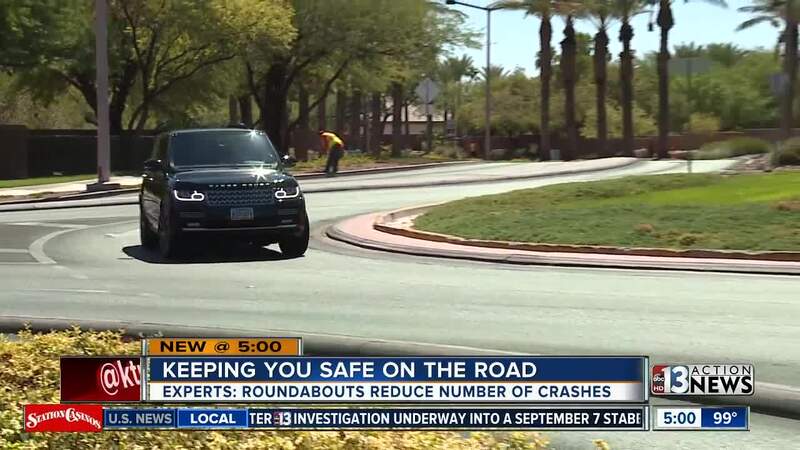 Local traffic safety experts are celebrating National Roundabouts Week, hoping to make drivers aware of them as they drive around Las Vegas. Las Vegas is home to one of the first modern roundabouts built in the country at Town Center Drive and Hualapai Way. During the week of Sept. 17, traffic safety advocates are joining the Federal Highway Administration in celebrating National Roundabout Week with the goal of educating drivers, pedestrians and bicyclists. “With reducing speed we’ll reduce fatalities,” says Andrew Bennett, Nevada Office of Traffic Safety. Bennett says roundabouts greatly reduce the number of crashes, noting that roundabouts count for a 90 percent decrease in deadly crashes and an 80 percent decrease in injury crashes. While roundabouts work to decrease crashes, they haven't been free of them. In August, a fatal crash happened at the roundabout at Town Center Drive and Flamingo Road . The driver at fault was driving too fast around the curve and was under the influence, according to police. Bennett says this week is all about helping residents better understand how to use them and why they should "celebrate" them as well. Clark County has plans in the works to build more roundabouts around the valley, including Summerlin and Henderson.